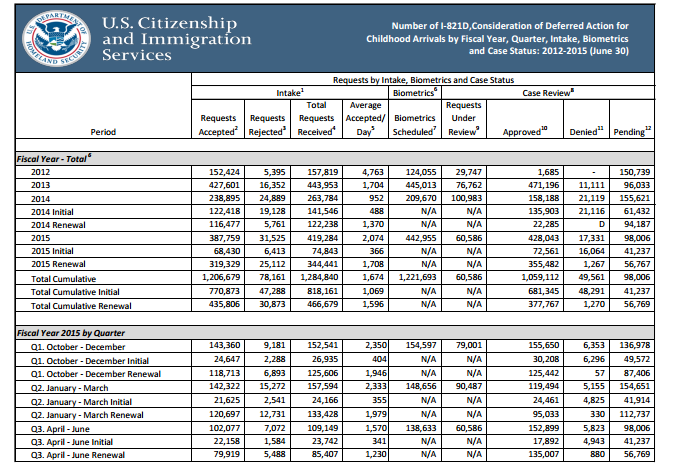 USCIS has published statistics concerning the volume of Deferred Action of Childhood Arrivals applications received from fiscal year 2012 through fiscal year 2015. 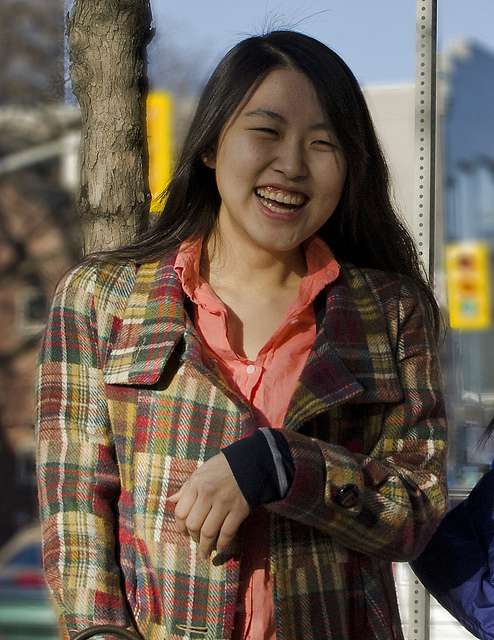 In fiscal year 2012 USCIS accepted 152,424 applications out of 157,819 applications received. That year, 5,395 applications were rejected during initial intake. 1,685 applications were approved during case review at the end of the fiscal year. Remaining applications either remained pending at the end of the fiscal year or were denied. In fiscal year 2013 USCIS accepted 427,601 applications out of 443,953 applications received. That year, 16,352 applications were rejected during initial intake. 471,196 applications were approved during case review at the end of the fiscal year. Remaining applications either remained pending at the end of the fiscal year or were denied. In fiscal year 2014 USCIS accepted 238,895 applications out of 263,784 applications received. That year, 24,889 applications were rejected during initial intake. 158,188 applications were approved during case review at the end of the fiscal year. Remaining applications either remained pending at the end of the fiscal year or were denied. In FY 2014 USCIS accepted 122,418 initial DACA applications out of 141,546 applications received. 19,128 applications were rejected during initial intake and 135,903 applications were approved during case review at the end of the fiscal year. Remaining applications either remained pending at the end of the fiscal year or were denied. USCIS accepted 116,477 renewal DACA applications out of 122,238 applications received. During that year, 5,761 applications were rejected during initial intake and 22,285 applications were approved during case review at the end of the fiscal year. Remaining applications either remained pending at the end of the fiscal year or were denied. In fiscal year 2015, USCIS accepted 387,759 applications out of 419,284 applications received. That year, 31,525 applications were rejected during initial intake and 428,043 applications were approved during case review at the end of the fiscal year. Remaining applications either remained pending at the end of the fiscal year or were denied. That same year, USCIS accepted 68,430 initial DACA applications out of 74,843 applications received. 6,413 applications were rejected during initial intake and 72,561 applications were approved during case review at the end of the fiscal year. Remaining applications either remained pending at the end of the fiscal year or were denied. In FY 2015 USCIS accepted 319,329 renewal applications out of 344,441 applications received. 25,112 applications were rejected during initial intake and 355,482 applications were approved during case review at the end of the fiscal year. Remaining applications either remained pending at the end of the fiscal year or were denied. The top 5 countries of citizenship of DACA applicants included Mexico, El Salvador, Guatemala, Honduras, and South Korea. For DACA eligibility please contact our office. For updates on extended DACA please continue to check our blog.